When Bill, our editor, told us we’d never reviewed Austere Command before, I was genuinely surprised. 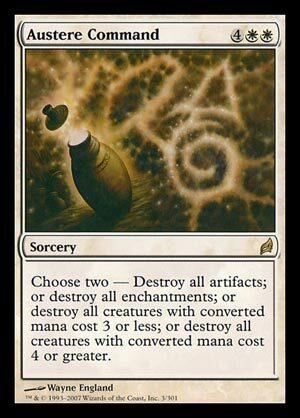 It’s part of one of the most famous and influential cycles from modern Magic design, and one of the best white control cards ever printed. Perhaps that is part of the reason why: maybe it was always clear to everyone that being able to destroy permanents on a table-wide scale is good, and being able to destroy permanents of your choice on a table-wide scale is even better. Still, it’s worth saying again. It’s the sort of Wrath of God effect that you can run in creature-heavy decks, where simply use the mode that doesn’t affect your cards (or that does, if you also have Reveillark . . .). It may be too expensive for traditional low-curve white aggro decks, but it’s powerful enough that many decks will consider developing their mana curve and color distribution in order to accommodate it – consider the Lorwyn block’s “Ten Commandments” five-color control decks. The other thing I like about the Commands is that all of them are good. Cryptic Command might be the standout, but all five can be stars in the right deck, and all five can do things even in larger formats. It’s curious in a way, because we often don’t get such balanced cycles in sets that have more “fair” overall design philosophies and that lack the equivalent of Lorwyn‘s dominant Faeries and Reveillark. I wonder what’s changed . . .
As a quick reminder, flexibility in effects tends to command a bit more of a premium in mana cost than other cards…for example, Armageddon and Wrath of God both cost 4 mana, while Catastrophe (both of them spliced together) costs 6 mana. Hence Austere Command: you could likely get each pieces of this card for a lot cheaper, but the reason this card is powerful is because you can do a lot of things that are tailored to the circumstances you’re in. You have a token army, but your opponents have huge creatures? Keep your army and nuke theirs. Your enchantments being ruined by their artifacts? Cool, keep one and not the other. Flexibility is sometimes underrated; every card in a deck matters, and sometimes it makes sense to go for one card that’s the jack of all trades than the card that’s a very narrow master of one. It may not be Cryptic Command, but Austere Command is a staple in Commander, and for good reason. It does a lot of things and asks little of it, even if most of it is a bit of an overpay off of a more specialized answer.